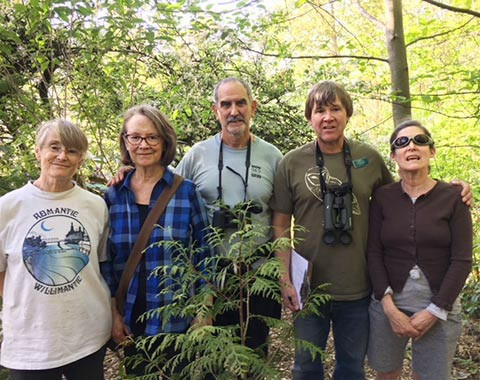 The Harrison Ridge Greenbelt volunteer forest stewards hosted Lead Naturalist, Ed Dominguez from the Seward Park Audubon Center this past Wednesday, April 25. The visit brought two new neighbors into the fold of our Greenbelt team and was enjoyed by all. The Stewards had identified four areas within the site that they wished to have some expertise guidance for creating an optimum bird habitat. Ed did not disappoint! For two hours we wondered among the trees as he identified birds by sight and sound. We even spotted the first migrating warbler of the season! Naturalist Ed Dominguez with some of the event’s participants. Ed was most complimentary of our restoration efforts that have had a primary goal of fostering birdlife. He had some suggestions for additional plant material and gave us some pointers for respecting nesting areas. The Stewards felt that we received both positive validation of our own efforts as well as tips for continuing success. Thank you, Ed! We are most appreciative. It has been 11 years since our neighbor, Wallis Bolz, took up the challenge of restoring our neighborhood’s special place, Alder Creek. It is the wild space at the dead end of 26th Ave East and East Helen. Once an overgrown, impenetrable patch of blackberries, ivy and bindweed, it has been transformed to a wild place filled with native plants and birds. A stream runs through it and trails built over the years by volunteers provide a quiet, private spot to relax in the busy city. Over the years a group of regular volunteers have spent three hours each month weeding, planting, and mulching with wood chips. These second Saturday work parties have been augmented with United Way and other community-wide volunteer groups that have allowed us to make real progress. The ivy and blackberries are almost gone! The birds are loving the snags and brushy undergrowth. Many neighbors don’t even know that Alder Creek is a public space so we are having a 11th Anniversary Celebration on June 3, Sunday, from 10 AM to noon. We’ll provide donuts and coffee. Penny Bolton of Seattle Audubon will bring a collection of bird skins that represent the species we have in Alder Creek and your yards. Meet your neighbors, let the kids play on the logs, and learn about our project. Fifteen members of the advertising firm VML donned old clothes and gloves to take on the Harrison Ridge Greenbelt. The firm is committed to volunteer events as a team-building experience. When forest stewards Cathy Nunneley and Trina Wherry handed out tools and explained the task at hand several members looked somewhat aghast. The area we intended to work on was a slope thick with thorny blackberries, spider webs and other entanglements. This work was a far cry from their usual day of sit down computer tasks. However, fueled onward with coffee generously donated by Starbucks, they plunged right into it. It was amusing for Cathy and Trina to hear the banter of colleagues that had never seen each other outside of the office. It was fun! “Sure beats being trapped inside on a sunny day!” exclaimed one worker. The group cleared about 800 sq. ft. of invasive plants. They then covered the land with burlap and chips. This 3-hour event accomplished what Cathy and Trina are able to do in two years!! The area is now ready for the planting native species to expedite the way to a future healthy urban forest. Much gratitude to VML for choosing our reforestation site. Please join your neighbors in a two hour contribution to the reforestation of our beloved greenbelt. We will be doing light weeding and spreading burlap sacks and wood chip mulch. Become a part of Forterra, the most successful urban forestry organization in America. Your friendly neighborhood forest stewards, Cathy Nunneley and Trina Wherry, will be forever grateful. All gloves and tools provided. Steve Lorton, former Pacific Northwest editor of Sunset Magazine will lead this walking tour and share stories about Madison Park’s oldest resident flora and some recent young ones, too. It’s a great opportunity to learn more about the neighborhood. Great for kids and grandparents and friends. Enjoy lunch in Madison Park after the walk. Sponsored by the Madison Park Community Council. Saturday, June 3rd, 10:30 am. would love to come. I assume we just show up? In the first chapter of the Greenbelt history, we presented the story of the initial attempt to develop the hillside along 32nd Avenue E between E Denny and E John. During the late ‘60s and early ‘70s the community rallied together to block the building of a low- income housing project. Then, after twenty years of quiet, another threat to the woods brought the community together. This rallying cry was the genesis for the current community council, which at that time was named Harrison-Denny Community Council. In the early 1990s, a neighbor across the street from the Greenbelt contacted community activists reporting that a sign had been posted. The sign stated a lot owner’s intent to begin building a house. The owner was contacted and after hearing the community’s wish to preserve the site, agreed to sell his lot to the City. At that time, the City of Seattle had funds to acquire undeveloped land to preserve green spaces in the neighborhoods. Communities were becoming aware of a development boom and were concerned that their beautiful green city would someday be lost to construction. In those days, $6,000 was the cost of an average lot. This acquisition effort of the City has resulted in the many green spaces you see throughout Seattle neighborhoods today. Well-known community activists and leaders, Peggy and Jerry Sussman organized a small band of like-minded neighbors and decided to reinstate a community council. The Council would enable the group to create an organized forum to present the community’s concerns to Seattle City Council. The newly minted Harrison-Denny Community Council became an instantly popular magnet and attracted up to 100 residents and business owners at each meeting. The annual spaghetti dinner was always sold out and the treasury was filled with proceeds from the tremendously successful rummage sale. Of course, the first order of business for the new Council was the protection of the neighborhood’s only wild green-space, the Harrison Ridge Greenbelt. The few other lot owners in the Greenbelt readily agreed to sell their properties to the City. They enjoyed a generous compensation. One parcel, owned by King County, was gifted to the community. However, one lot owner was not moved by the community’s spirit and refused to cooperate. Again, the appearance of a sign along the street alerted neighbors of an intent to develop the site. The owner had applied for his property to be re-platted from 3 into 2 lots and intended to build 2 large houses. When he realized that the community was moving against his plans, he brought in bulldozers and began clearing the property. The Council immediately contacted the City and a stop work order was issued. Subsequent hearings with the Seattle City Council resulted in a judgment against the owner. In an unprecedented move, the City condemned the property under the right of eminent domain. This Washington State constitutional law allowed the government to acquire and preserve pieces of undeveloped property as parks or green spaces. The City was required to pay a fair market value for such land and negotiated a price with the property owner. A reduced price was paid due to the destruction of the land. The entire community was ecstatic as the realization of many months of perseverance resulted in a new park. The 6.2 acres of the wooded hillside became officially known as the Harrison Ridge Greenbelt. Now that the community had realized its goal of preserving the green space, the next step was to care for this property. That part of the Greenbelt history will be presented in the next chapter. Bush teacher Ben Wheeler’s elective Urban Forestry class has taken to the muddy slopes of the Harrison Ridge Greenbelt with smiles all around. It’s a popular class. Ben combines classroom learning with two days of field work per week for several weeks of two sessions a year in the spring and fall. 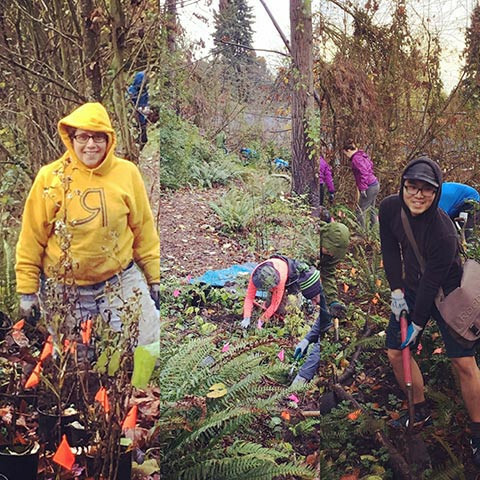 The students use picks and loppers to remove invasive plants such as ivy and blackberries. They create “life rings” around trees to protect them from the invasives. A layer of burlap and wood chips is then put down over the newly bare areas. Each session has its own rewards. In spring, the students experience the bare branches of shrubs and trees at the beginning of their session and then delight in the leafing out and flowering that occurs over the weeks. Fall’s reward is the installation of new plants. The Parks Department delivers a treasure trove of native ferns, trees, and shrubs that were ordered by the Greenbelt’s forest stewards. It’s tons of fun to plant the new forest baby plants. Ben Wheeler working alongside a student. Some people mistakenly think that the wild areas around Seattle can be left unattended. This attitude of benevolent neglect, however, does not promote a healthy urban forest. 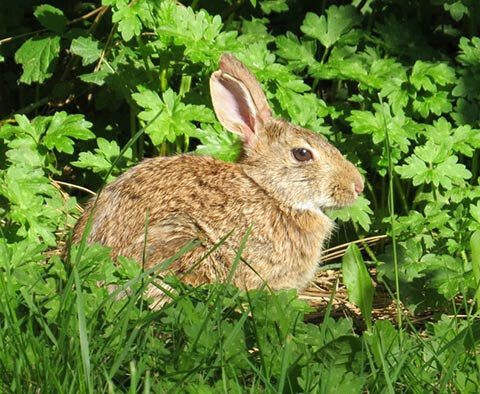 Committed removal of invasive plants and the nurturing of a diverse selection of new natives create sustainable flora and habitat for wildlife. Harrison Ridge Greenbelt Forest Stewards Trina Wherry and Catherine Nunneley are immensely grateful to Ben and his students. We love working alongside them and are always astonished at the huge progress they are able to make. Thanks a bunch, Bush School! !